Whether you’re reseeding your lovely bed of grass for the third time this season, or you’re hoping that your vegetable garden will bear one more bountiful harvest, nonstop planting takes an inevitable toll on your soil. Vegetables and grass demand a lot of nutrients that cannot always be replenished when you fail to give your land a break. Though you may have heard of cover crops, also known as green manures, you probably think that they’re only useful for industrial farmers looking to maximize their harvest. This common misconception is prevalent among home gardeners. The truth is, anyone can use cover crops, no matter the size of the garden or the scope of the land. The use of cover crops dates all the way back to the ancient Roman Empire. Early gardeners figured out that rather than depleting the land of all its’ natural resources to grow more in a particular season, they should look at the bigger picture and sacrifice a few months of the harvest to ensure the long-term health of the soil. Cover cropping is all about forethought and fertilizing the ground to prepare it for heavy feeders in the coming season. Though they take a little extra time and effort to plant, the results will be well worth your careful tending. Cover crops are the organic gardener’s dream, as they naturally repair, replenish, and revive tired soil without the use of harmful toxins. Cover crops should be sown as seeds directly into the ground at the end or beginning of the growing season. To plant cover crops by hand, lightly till the ground with a garden rake to expose soil, broadcast seeds, and rake them into the garden. This should be done right before a rain if possible. If not, water the area lightly. If your cover crops cover a large area, mowing a few times during their growth can increase root growth and prevent unruly spread. At the end of the cover crops growing season, you will want to kill your crop to make room for your new plants to flourish. Wait until your cover crop is as mature as possible without going to seed, this will most likely be the time when it is in flower. To kill it, figure out which method works best for the particular cover crop that you planted. Some will die just from mowing, weed-eating, or tilling, but others may require more intensive methods. Wait 2-3 weeks after tilling to plant over the area, as the nutrients from the cover crop will still be working their way into the soil as the plant matter decomposes. Choosing the appropriate cover crop for your lawn or garden can be challenging and overwhelming as there are many different resources that all seem to disagree about appropriate cover crop planting. Ultimately, it is a decision that must be made based on personal goals for your garden, the needs of your soil, and the region that you are planting in. Identify your goals before picking your cover crop. Do you need something that will restore nitrogen to depleted soil? Or are you looking for green manure that will prevent erosion and fix soil structure? Is your garden prone to excessive weed growth and you are tired of spending your spring pulling stubborn invaders? Try to choose a green manure type that serves multiple purposes for your garden. You can even mix varieties to utilize their soil restoration benefits. Remember, the whole purpose of cover crops is practicing good crop rotation and giving the soil a break while restoring nutrients. Be sure that you are not planting green manure that takes a similar toll on the land as your main crops. For instance, you would not want to plant a legume such as field beans if you are looking to use the same plot of land for peas or runner beans in the upcoming season. There are many different types and varieties of clover, but all essentially serve the same purpose. All colors of clover convert nitrogen and return it to the earth while building healthy soil and restoring nutrients. Yellow blossom sweet clover is particularly beneficial for building soil structure, while crimson clover serves to attract beneficial insects. White dutch clover is the primary option for a living mulch as it decomposes well into the soil and prevents weed growth. 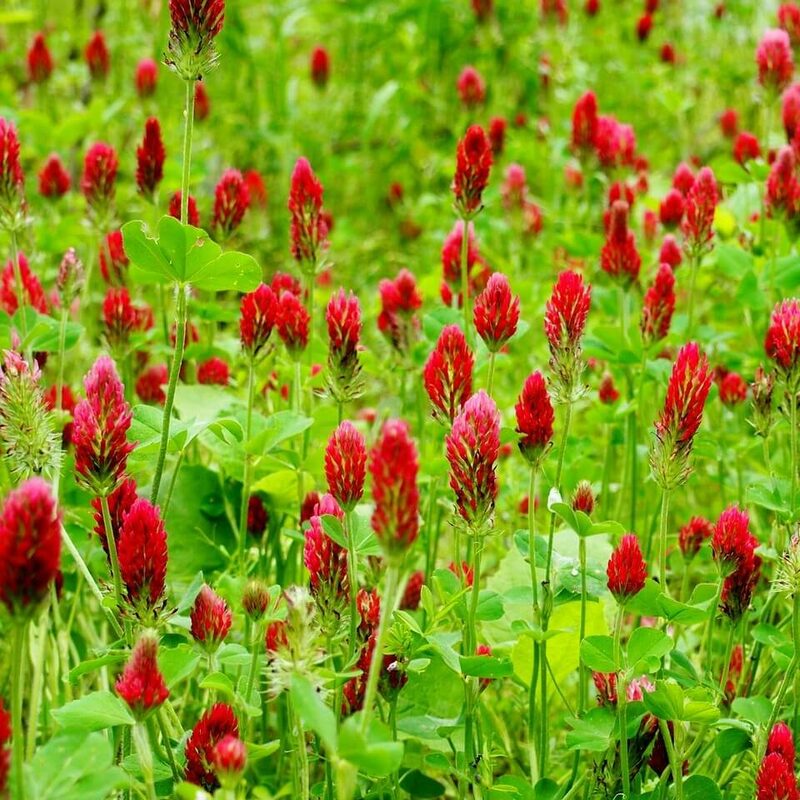 Clover can be planted as a summer or winter cover crop in most regions of the United States. This type of cover crop is most beneficial if you are looking for something to prevent erosion, add organic matter to the soil, and attract helpful insects. These peas are also renowned for their ability to absorb nitrogen and transfer it back to the soil, making it usable for the next plant. Sow Austrian winter peas in the fall, before the first frost. Rye is an excellent choice for poorly managed, acidic, or sandy soil. Both types of rye, annual and cereal, serve to prevent weed growth, control erosion and add organic matter. This hardy grass grows fast and is easy to kill at the end of the season. Plant rye in late summer or early fall. This cover crop is often referred to as a complete natural fertilizer. It thrives well in dry soil as its deep roots serve to improve the structure of the subsoil and convert nitrogen. Sow in mid-spring to midsummer. Till into the ground in late fall or leave over the winter and till in spring to protect the soil. This cover crop produces bountiful organic matter and improves soil structure Fodder radish is a low-maintenance cover crop that will decompose into the soil with little effort on your part. Planted in the fall, it will die over the winter and gradually release its nutrients into the ground. Till soil lightly in spring to complete the process. Hairy vetch works well in Northern climates and can thrive over the winter, adding healthy nutrients back into the soil throughout the dormant season. This annual tolerates moderate drainage and is excellent for capturing and converting nitrogen. Sow in late summer or fall. This cross between sudangrass and sorghum is a voracious hybrid that provides all the benefits of both kinds of grass simultaneously. It can grow up to 12 feet tall, providing liberal amounts of organic matter. Left unchecked, this cover crop may take over your garden. Keep it contained by mowing it to 6 inches when it reaches 3 feet. Sow 7 weeks before first expected frost to prevent overgrowth. This fast-growing, heat-tolerant green manure can survive in acidic and infertile soils while restoring a healthy balance to the land and leaving behind rich nutrients. Its broad leaves provide a thick ground cover that prevents weed seeds from ever seeing the sun, thereby cutting off their growth and ensuring a weed-less garden, reducing your work for the coming season. If you are looking for a cover crop to fill time between an early season and a late season crop, you can sow buckwheat in early July to take advantage of this short midseason window. Plus, the white flowers that buckwheat produces work wonderfully to attract pollinators and can also add flare to and fullness to floral arrangements for your table. Oats serve to suppress weeds, scavenge nutrients, and prevent erosion. Sow in early spring to midsummer if you live in a cooler climate. Southern growers should plant in fall as oats don’t do well in intense heat. Try sowing oats in combination with a legume such as field peas to fix nitrogen, and provide lots of organic matter. This cool-season, cereal grain can add organic matter back to the soil by serving as a living mulch while suppressing weeds and providing erosion control. It tolerates drought but is slightly finicky and prefers medium-rich loam soil. Barley improves soil aggregation and can protect nutrient-dense topsoil during seasons of drought. Its diverse survivability allows it to be planted in fall or spring depending on your garden’s need. While figuring out the best method for cover crop planting can be a little tricky, you can become a pro in no time with a bit of trial and error. Experiment with the different green manure that works best for your land and climate, and remember to have fun cultivating your organic garden!